The Burger movement has me in it's grasp. I should explain. The foodie movement has taken back the burger. (I should state from the outset that I don't care for the term foodie.) Would you call someone into stamp collecting a stampie? Or a car nut a car-y? I don't think you would, why foodie is acceptable is beyond me. But these foodies, as poorly named as they may be have done good work. They've made the average and the benign tasty again. Food trucks for example, long a staple of construction sites are now peddling the tastiest food options in town in many cases. And these oddly monikered foodies are to be thanked for a lot of these gastronomic gains. 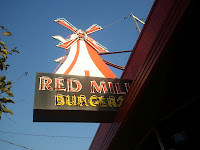 In Seattle alone burgers abound, with some of the best one's I've had coming from Spring Hill, Bastille and the Virginia Inn. Even your standard burger joints like Red Mill are putting out the goodness. And whomever invented the burger/bleu cheese combination should be canonized. Since we've taken back burgers, it's time to take back "burger wines." Once thought of as a dismissive label the fact is this new high octane burgers need worthy burger wines. Today's Friday Find is a winner, winner, burger for dinner. 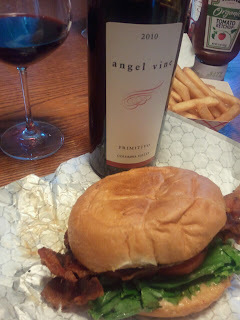 The 2010 Primitivo from Angelvine Wine an Oregon winery producing Washington wines, delivers deep savory flavors and a robustness to stand up to a little char on that burger as well as that beautiful bleu cheese burger combination. This close cousin of Zinfandel is a ripe and robust one black plum, pepper, smoke and savory herbs with a long finish. The alcohol percentage is high, which is a common element of this varietal and a bit of heat on the wine will disappear if you let it sit for a few. At the $20 mark this wine delivers a rarer bird from Washington and the Northwest but one you should surely enjoy...with a burger.